It started in a family-run shop and ended with a lonely 17 years in prison. Between those two fateful events, time would see the rise and fall of Italy’s largest dairy company along with the football club that it bankrolled. Parma, 1961: a young 22-year-old by the name of Calisto Tanzi has just inherited the family-run ham retail company after the passing of his father. Over the next 40 years, Tanzi will transform this family business into one of the biggest dairy companies in the world. The name he gives it is Parmalat. Throughout the 1980s and 90s the business explodes onto the scene, spreading its wings worldwide. In turn, it becomes one of the jewels of the Italian commerce industry, a model for all others to follow. By the early noughties, Parmalat has over 36,000 employees across the globe and controls a whopping 50 percent market share in its native Italy. Tanzi and his family have become rich beyond their wildest dreams. They are hailed as the first family of Parma alongside the Barilla family – of pasta-making fame – who also reside in the city. Yet while Barilla’s success is built on a steady foundation, Tanzi’s empire is a lie. A lie that will eventually implode and lead to one of the biggest financial scandals Europe, never mind Italy, has ever seen. For now, however, the good times continue to roll. Like any self-respecting Italian, Tanzi holds a deep affection for the game of calcio and in 1991 he decides to buy his local football club, AC Parma, after the untimely death of then-president Ernesto Ceresini. There is a classic train of thought in Italy that you haven’t really made it big until you own a football club. The Tanzi family, and by extension Parmalat, now owned a 98 percent share in the club, with one of Ceresini’s three sons holding on to a small stake. The Parma of the time was by no means a giant of the Italian game. Yes, they did have a lengthy history having existed in one form or another since 1913, but the club had never played in Serie A and spent most of its time jumping between Serie C and B. A year before the arrival of Parmalat, the club, under the guidance of legendary coach Nevio Scala, finally made it to the Promised Land. Not content with just playing their part, Parma, now backed by Tanzi’s money, were about to shake a few feathers loose. In 1992, the Crociati won their first major trophy in the form of the Coppa Italia, beating Juventus in the final. The 1992/93 season was to bring further success as they won both the Cup Winners’ Cup and the UEFA Super Cup. Parma had well and truly arrived. 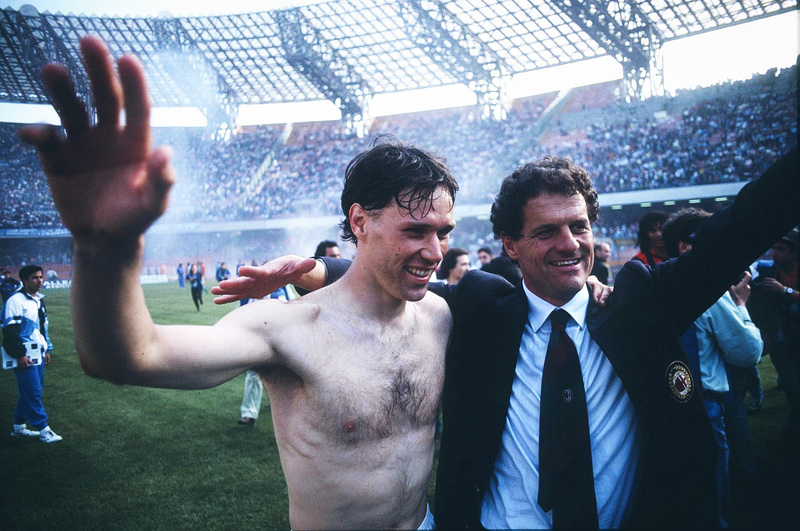 Tanzi spent millions to fuel his passion as some of the biggest names in world football plied their trade at the Stadio Tardini during one stage or another of the Parmalat era. Asprilla, Dino Baggio, Cannavaro, Chiesa, Crespo, Stoichkov, Thuram, Verón and Zola, to name just a few, wore the famous yellow and blue jerseys. The youth system wasn’t bad either, churning out talents such as Gianluigi Buffon and later Giuseppe Rossi. In 1995 they won the UEFA Cup for the first time, beating fierce rivals Juventus in the final. The 1996/97 season would see them finish second in Serie A, the highest they would ever achieve. Bankrolled by Parmalat, this small provincial Italian club, from a city with a population of around 170,000 people, had grown into a giant of the Italian and European game in the space of no more than seven years. More success was still to follow and in 1999 the club won both the Coppa Italia and the UEFA Cup, truly cementing their legacy in the calcio annals. Naturally, though, when so-called smaller clubs start to win, the big clubs come and cherry pick their best players. Fan favourite Hernán Crespo left in 2000 for an eye-watering £35.5m and academy graduate Buffon went the following year to Juventus for £32.6m. Lilian Thuram went in 2002 for €41.5m and, by then, many of the senior players had been disbanded from the squad. The year Thuram left was incidentally also the first since promotion that Parma finished outside the top six in the league. This amazing run earned them a place in what would be known as the Sette Sorelle (Seven Sisters) of Italian football alongside Milan, Inter, Juventus, Fiorentina, Lazio and Roma. However, while the people of Parma basked in the success of their football club, dark clouds were circling high above. In 2013, it emerged that Parmalat were having difficulty in paying off a €150m bond yield. This proved particularly puzzling to many experts as the company was supposedly sitting on a €3.9bn cash pile in a Bank of America account. Initially the company waved it off as nothing serious, assuring everyone that it would be sorted in due course. It wasn’t sorted out; in fact, things took a turn straight off a cliff. Later that same month, the company announced that the €3.9bn never existed. Parmalat was in turmoil. Further digging by Bank of America turned up that transfer documents to and from the account had all been forgeries. Shares in the company were immediately lowered to junk status before trading in Parmalat was frozen altogether. Calisto Tanzi, along with a number of family members and company executives, was soon arrested for fraud, embezzlement and false accounting. After trying to distance himself from the scandal, Luca Sala, Bank of America’s Chief of Corporate Finance in Italy, also admitted to taking part in a kickback scheme. As part of the case against Tanzi, investigators dug deeper into the accounts. What they discovered was one of the biggest fraud and false accounting schemes Europe had ever seen. The €3.9bn was only the tip of the iceberg; in truth, the company had a €14.3bn black hole in its accounts, almost four times what it first admitted. US creditors quickly launched a $10bn class-action suit against the devastated company. The crisis became so critical that by December 2004 the Italian government had to step in and force through emergency legislation which would speed up the bankruptcy process and protect payrolls, vendors and industrial activity. For some, however, the scandal of what they concocted proved too much. Alessandro Bassi, an aide to Fausto Tonna, committed suicide in early 2004. Tonna, who was the company finance director for 16 years, was seen as Tanzi’s right-hand man throughout the affair and in 2008 he received a two-and-a-half-year jail sentence for his part. Described by his fellow bankers as “a bit of a peasant in his manners, but having an extremely sharp mind for finances”, Tonna was the mastermind behind a complex web of offshore subsidiaries. Needless to say, the now toxic nature of Parmalat had a detrimental effect on the city and the football club. For the 2003 financial year, AC Parma announced an operating loss of €77m. Perhaps the best way of describing the situation at the club would be to compare it to what befall Leeds United a few years ago, only this one was jacked up on steroids and taking place in the shadows of Europe’s largest fraud scam. A fire sale of the team’s top talent was required to keep the club afloat. The board resigned en mass and new owners were sought. It proved futile initially; the Barilla family was not interested in taking over and other buyers could not be found. The club was declared insolvent. However, the Gialloblu managed to find a legal loophole that meant they would be able to continue competing as a Serie A side. The club made an ever so small change to their name, going from AC Parma to FC Parma. It was enough to stay in the top flight and maintain their television income while luring players good enough to continue competing. Amazingly, while this was all happening off the pitch, on it the team managed to reach another UEFA Cup semi-final. Things in Serie A, though, were completely different as they battled against the drop. In fact, it came down to a two-legged relegation playoff against Emilia-Romagna rivals Bologna to see who would be staying in Serie A for the 2005/06 season. With the very real fear that relegation may finish them off for good, the club fielded a reserve side in the UEFA Cup semis against eventual winners CSKA Moscow and concentrated all their energies on the matches against Bologna. Things didn’t go well as Parma lost the first leg 1-0 at home. Yet backed up by a huge travelling support and inspired performances from Alberto Gilardino and Sebastian Frey, the Crociati battled back to win 2-0 and secure their Serie A status. Serie A had been maintained but a new age of austerity was being ushered in. 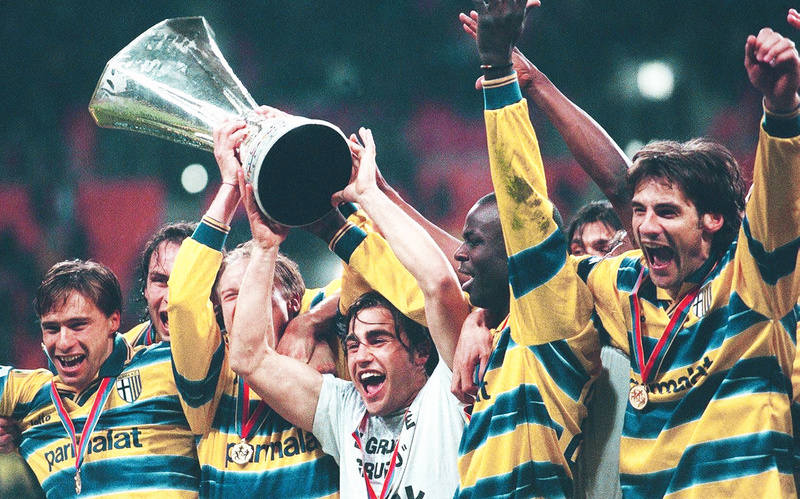 The Parma that challenged for title after title was no more. The club was put under the control of a temporary administration. Former Real Madrid president Lorenzo Sanz was supposedly interested in purchasing the club, but a deal was never agreed. They were eventually sold at auction in January 2007 when Italian entrepreneur Tommaso Ghirardi bought them for an estimated €30m. Since then the club has suffered countless highs and lows. Meanwhile Calisto Tanzi, now 79 years of age, frail and disowned by large sections of his family, spends his time locked behind bars, serving a 17-year jail sentence, his empire nothing but a distant memory. Off the pitch, Parma’s fairy tale was a sham and a lie. On it, however, the fairy tale was a distinct reality. This small provincial club had risen to unforeseen heights and conquered those that stood in their way. They stared death in the face and lived to tell the remarkable tale. Through thick and thin, no man, not even Calisto Tanzi, is greater than the club, as Parma have well and truly proved to their credit.